Whiskeytown Lake offers up a sobering recovery timeframe. 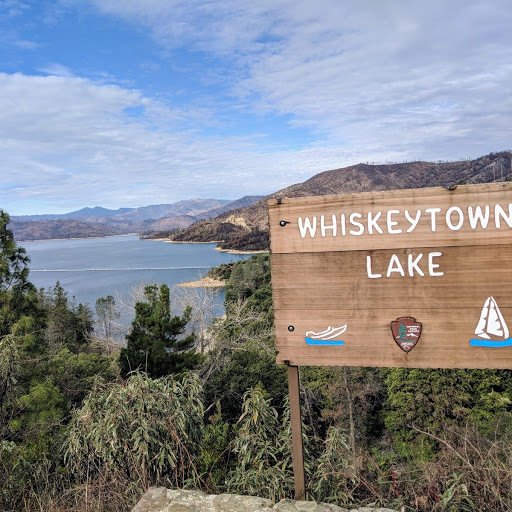 Whiskeytown is a very popular kokanee fishery that also supports good populations of trout bass, and sunfish. The lake is also a popular destination for kayak anglers and for those that just enjoy paddling around the many coves and islands of the lake. The lake and surrounding recreation area, hosting miles of hiking trails, is managed by the National Park Service. Last year's Carr Fire, which started just off Highway 299 near the Carr Powerhouse at Whiskeytown Lake, devastated most of the area surrounding the lake. The burn scar is to the waterline in many areas, while some small patches of green give reminders of the past beauty of the lake. The recovery and reopening of public access areas in many sections will be slow. While the Whiskey Creek boat launch is now open for public use, the popular Brandy Creek ramp, campgrounds, and day use areas remain closed for the immediate future. Oak Bottom Marina may open in a month or so as the docks have been repaired and replaced. Much of the issues for reopening the closed areas are public safety, and that the infrastructure of the area was destroyed by the fire. Water service for restrooms, campgrounds, and day use areas was wiped out, and until these services can be repaired and reestablished, these areas will remain closed. Also, the popular trail systems on the Southwest side of the lake are closed off due to dangers of debris flows and falling timber and rocks. Since the fire, some small vehicle-sized boulders have come off the mountain into the Brandy Creek area, according to park officials. Road access to the area is currently closed off at the dam. There are some trails and access open below the Whiskeytown Dam in the Clear Creek area as well as access around the Carr Powerhouse. But, according to the Visitor's Center which is also open, some campgrounds may take up to a couple of years to reopen. As of yesterday, day use fees are suspended by the Park Service for those wishing to enjoy what is available at the lake. There was no posted date for the resumption of fees, so always stop by the Visitor's Center to check when you visit. The Visitor's Center also posts updates on open areas of the lake as well as closures. Many have expressed concern about the health of the Kokanee fishery at Whiskeytown due the sediment found in the creeks that support the spawn. The CDFW has secured 50,000 kokanee fry from egg collection projects at Stampede Reservoir in the Sierras to complement any surviving fry at Whiskeytown. The outlook for this year's fishery remains strong as does the future. The CDFW is strongly invested in supporting this valued fishery. The lake is fish-able at this time with very little boat and angler traffic visible on the lake. While a couple of boat trailers were parked at the Whiskey Creek ramp, the only thing sighted on the lake was a lone kayak in the middle of the lake. With the lack of anglers fishing the lake current fishing reports are non-existent, but historically this is a good fishing lake with many opportunities for those willing to put in the time to locate the fish.